I made up a few of these and they are relatively easy to source so I thought I'd put out how it's done and give the info to make your own. I doubt many of you would try this, but here's all the info. The only problem is because of the PCB ordering process you get 10 PCB's at a time. If you can make your own single sided PCB's, I have a board setup that you can use as well. This is a small PCB with a 15amp relay and 3 fused outputs. It's meant as a central power point for multiple accessories like Heated Grip or heated clothes plugs, accessory lights, USB chargers or cigarette lighter power connectors. Really anything that draws power only when the bike is turned on. You connect one side to Ground, Battery Positive, and Switched Power. You might need to hunt around or check your service manual to find a switched power wire to tap into that turns on with the turn of the key. 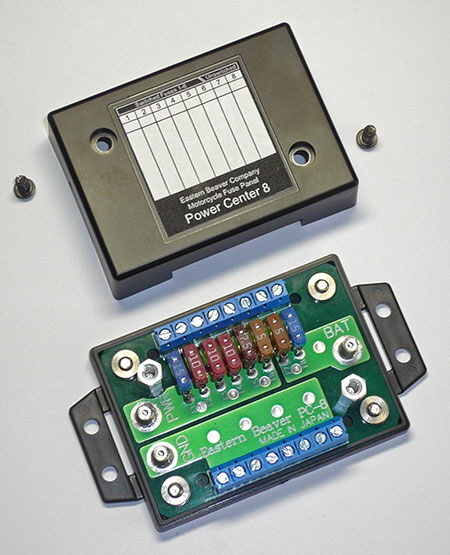 Once it gets power to the switched power line, the relay clicks over and supplies power to the three outputs though the fuses. The little light goes on when the power is switched on to show that it's working and that it's enabled. The inputs and outputs are wire terminal connectors so you strip a wire put it in the connector and screw it down to lock it in place. The fuses it uses are mini blade fuses. It's a very scaled down version of this: http://fuzeblocks.com/ but most people only need a few small accessories. This is the Bill of Materials. These parts are available from Digikey.ca ($8 shipping). You can source cheaper parts for everything except the fuse holders from places like dx or ebay, but I wouldn't. The relay is a proper sealed automotive rated relay. The quality is much higher than the cheap ones with the same footprint that you can get from Chinese discount. 1n4148 - just search, if you want a specific part number let me know, but these can be gotten from Sayal or Active as well. *** I'll post the gerbers later so you can order your own PCB's if you want, but there's a few things I want to improve first. The PCB's you can get from iteadstudio.com or seeedstudio.com. The reason for the size and shape of these boards is to fall under the 5cm x 5cm size when ordering from these PCB prototyping places. You get 10 boards in this size for ~$10 plus shipping. Once I put up the gerber files in a zip, all you need to do is attach them to your order and they know what to do. Anyways, here's the parts. You have the option of using a big through hole resistor and diode or those tiny SMD parts. I use the tiny parts. The big parts are to show you what they look like. coating most of this with the epoxy will also help you waterproof your setup. I conformal coat the bottom just to make sure there are no shorts. The rest of it does not need epoxy as long as it's not put in a place where it will be submerged or directly rained on. The relay is waterproof and the metal in the fuse holder is tin/nickel plated for corrosion resistance, which makes them a little annoying to solder. Mark, your project is Awesome. I wish something like this was available a few years ago. I had purchased a PC-8 (see below) for quite a pricy sum. But at least Ive used it for several bikes and it works well for switched and direct connections. I have heated grips, stebel horn, USB socket and Garmin GPS powered from there. This thread is over a year old. Did you make the improvements you planned? Are the Gerber files available someplace? Hmm... don't know what I did with this. I'll check the board files and see what I did. If everything is okay, I'll just export the gerbers and post. The zip file is what you would send. I might have a couple of these left if you just want one. Thanks for posting. I wish I could design PCB's. What program did you use to design the PCB? "Good judgment comes from bad experience, and a lot of bad experience comes from bad judgment." I used Eagle to design the PCB. There are a lot of tutorials for it online. It's free crippleware. I ordered 10 boards and got 25 shipped. If anyone wants one. Pm me. It's been a long time since I made these. Bought a 3D printer over the holidays, so I finally made up a box for it. Again, doesn't really need one, but it's definitely prettier. Cool box. How long did it take your printer to output your box? 3d printing is on my list of stuff to learn. It takes about an hour to do the box and the lid right now. I can speed it up. The walls can be a little thinner and I can print it faster. Right now I can just about stand on the box, it's pretty solid. I'd like to redesign the lid system to something that can be resized easily and make a generic enclosure that I can tweak for the specific application. I have a lot of projects of different sizes that can use enclosures. This was designed in Fusion 360, which I'm still learning. I bought an Anet A8 printer. It's pretty cheap and it requires a lot of time to get prints working well. I'm still working on getting it better. If you want the files for the box, you can have them. Like I said, they are in Fusion 360 and they are a little rough as I'm still learning to use it. How difficult is it to learn the 3d CAD software? Is there something cheaper than Fusion 360? A monthly fee is a bit much.